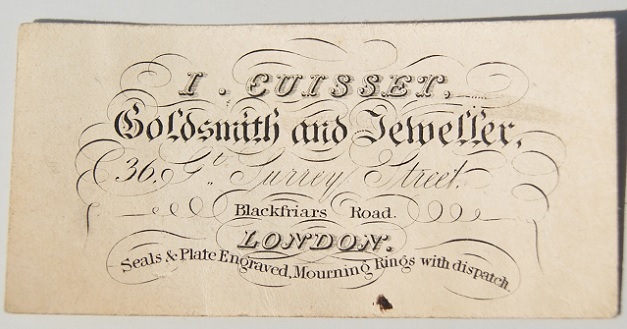 John Cuisset was recorded in 1835 as a wholesale jeweller at 38, Blackfriars Road, Surrey, In 1836 as a jeweller at 36, Blackfriars Road, Surrey, and from 1838 to 1846 as a silversmith and jeweller at 40, Blackfriars Road. As can be seen from the below notice, he suffered bankruptcy in 1842. He was noted as trading from 3, Crown Row, Walworth Road, Surrey in 1847 until at least 1849. JOHN HERMAN MERIVALE, Esq. one of Her Majesty's Commissioners authorised to act under a Fiat in Bankruptcy awarded and issued forth against John Cuisset of Blackfriars-road, in the parish of Christchurch, in the county of Surrey, Jeweller, Dealer and Chapman, will sit on the 29th day of March instant, at one in the afternoon precisely, at the Court of Bankruptcy, in Basinghall-street, in the city of London (by adjournment from the 8th day of March instant), in order to take the Last Examination of the said bankrupt; when and where be is required to surrender himself, and make a full discovery and disclosure of his estate and effects, and finish his examination and the creditors who have not already proved their debts, are to come prepared to prove the same, and, with these who have already proved their debts, are to assent to or dissent from the allowance of his certificate. John Cuisset entered his mark 'I·C' contained within an oblong punch with clipped corners, with the London Assay Office on the 7th December 1843.